The pathogenic mechanisms of ponatinib-induced hepatotoxicity are not fully understood. However, the histopathology findings of steatohepatitis and its response to corticosteroid suggested an inflammatory response; this has been previously described in imatinib-induced hepatotoxicity.6 The clinical finding of severe hepatic impairment was disproportionate to the liver biopsy findings in our patient, possibly partly contributed to by the commencement of corticosteroid therapy before biopsy was carried out. As the patient had no significant past medical illness to suggest non-alcoholic steatohepatitis, we were unable to conclude its relationship with the development of hepatic impairment in our patient. Corticosteroid therapy for severe hepatotoxicity and steatohepatitis induced by ponatinib has not, to our knowledge, been previously reported. 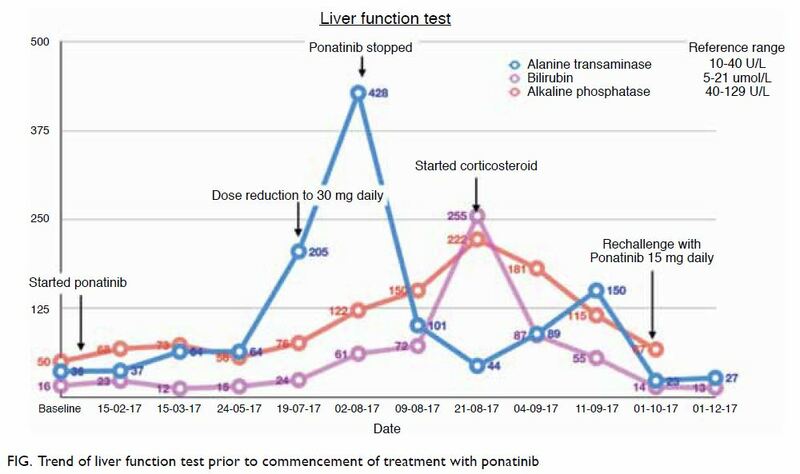 Corticosteroid therapy and rechallenge of ponatinib have potential for successfully treating patients with severe ponatinib-induced hepatotoxicity and T315I mutation CML. Acquisition of data: YL Boo, SG Toh. Analysis or interpretation of data: YL Boo, CCK Liam. Drafting of the manuscript: YL Boo, CCK Liam. The authors would like to thank the Director General of Health for permission to publish this article. This study was conducted in accordance with the Declaration of Helsinki. The patient provided written informed consent for publication. 1. Iclusig [package insert]. Cambridge, MA: Ariad Pharmaceuticals; 2012. 3. Price KE, Saleem N, Lee G, Steinberg M. Potential of ponatinib to treat chronic myeloid leukemia and acute lymphoblastic leukemia. Onco Targets Ther 2013;6:1111-8. 5. Ferrero D, Pogliani EM, Rege-Cambrin G, et al. Complete reversion of imatinib-induced hepatotoxicity in chronic myeloid leukemia patients by low-intermediate dose corticosteroid. Blood 2005;106:4856. 6. Ferrero D, Pogliani EM, Rege-Cambrin G, et al. Corticosteroids can reverse severe imatinib-induced hepatotoxicity. Haematologica 2006;91(6 Suppl):ECR27.